On May 19, 2009, I sent an e-mail to BC Ferries. Aside from the Customer Service office, I also sent this e-mail directly to the Captain of Fleet Operations for routes between Vancouver Island and the Lower Mainland, the Manager of Community Relations and the Liaison Committee contact for the Horseshoe Bay to Departure Bay route. A week passed and I received no response in any manner – not even so much as a confirmation that my concerns were being forwarded to the appropriate persons for review. I then re-sent the e-mail and asked for a proper response by end-of-business on Friday, May 29, 2009. Friday came and went with not a word. I have just e-mailed all the materials to Chris Olsen of CTV’s Olsen On Your Side. Here’s hoping that he will contact me. Until then, for your reading and viewing displeasure, here are the photographs and the letter sent to BC Ferries to which I received no response. I am a member of the public and a lifelong resident of British Columbia. Travel on BC Ferries has always been a part of my life and will continue to be. The service provided is essential to all British Columbians and is an important means of travel for those visiting our Province. What has always been apparent to me is that exceptional customer service is of penultimate importance to BC Ferries, second only to passenger safety. This is evident in the planning, staffing and expert operation of the corporation and its fleet. I have long been aware that BC Ferries has upheld a pet policy stating that pets can be transported on the vessels but that they must remain on vehicle decks at all times during the voyage (with the exception of guide dogs). Until recently, I was never a pet owner and was therefore unaffected by this policy. As I travel frequently on BC Ferries – up to several times each month – and now own a pet, I believe that this is something I need to very clearly address to BC Ferries Corporation. Several weeks ago I was a passenger on the new and beautiful Coastal Renaissance ship and, as expected, stayed in the pet area with my small dog. While the room is bright and enclosed to avoid engine exhaust and cold air, I found it far less than comfortable. Many of the very basic amenities that BC Ferries passengers have come to expect were entirely unavailable to me. There was no washroom for me to use, no water fountain to provide fresh drinking water for my dog or myself (the installation of a vending machine for food might also be thoughtful), no heat or other electric source, wire-mesh chairs that were unbelievably uncomfortable for a near two-hour voyage and – most importantly – I was unable to hear any safety announcements and was therefore completely unaware of what to do or where to go in the event of an emergency. 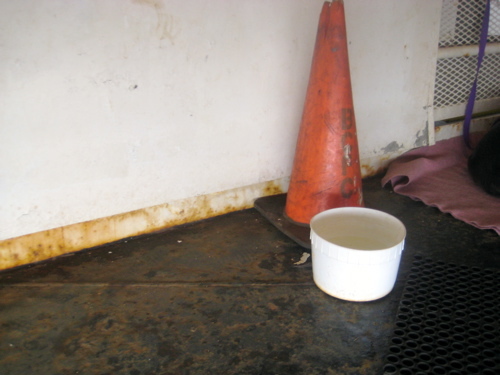 With the new luxury vessels that BC Ferries has recently welcomed into its fleet, the corporation had a great opportunity to ensure that an adequate area for pets and passengers would be installed, but it has failed in this regard. For the time being after that trip, I had resigned myself to this as being my only option as a passenger, but still found it incredible that I was being charged the exact same fare as the numerous other passengers who were able to enjoy not only the most basic of amenities, but also the abundant passenger services that BC Ferries offers on its vessels. All this while my dog and I were essentially quarantined to a steel-walled room on a vehicle deck. A lack of basic amenities that all passengers should be able to access, including a washroom, drinking water, comfortable air temperature, comfortable seating, et cetera. I have attached a number of photographs that I took yesterday to further illustrate the points and conditions outlined above. Were any pet owner to continually maintain such conditions at home for their pet, I have no doubt that said animal would be seized by the British Columbia Society for the Prevention of Cruelty to Animals (BC-SPCA). After about 30 minutes of cold, rushing air and sea spray entering the pet and passenger area, I moved towards the inside area of the vehicle deck for some respite. A crew member came up to me and my dog soon after and told me I could move to one of the stairwell landings between vehicle decks because, in his words, “at least you’ll be a little bit warmer.” I cannot even begin to imagine how much worse winter trips will be when temperatures dip well below zero degrees. While the gesture offered by your crew member was incredibly kind, I have one question for you: do you feel these are really and truly accommodations deemed appropriate and sufficient for paying customers of BC Ferries? I think it is fantastic that TransLink welcomes pets, within reason, on buses, Skytrains and the Seabus. Guide dogs, naturally, are also always welcome. However, that being said, a dog is a dog is a dog. If BC Ferries prohibits pets with the exception of guide dogs on the basis that they are either: 1) allergy-inducing; or 2) a potential for mess through urination or bowel movements, then these grounds are moot. A guide dog can cause the same potential issues as any pet, so the reasons behind the policy would be irrelevant. Like TransLink, I would encourage BC Ferries to amend their pet policy to allow small, well-behaved, contained animals in some passenger areas (with the exception of food services areas and childrens’ play areas) in the interests of passenger and pet comfort as well as to maintain the top-notch customer service that BC Ferries has become known for. While a policy amendment would be most ideal and, in my opinion reasonable, what is most crucial in the immediate circumstance is that the alarming and horrific safety and sanitary deficiencies be remedied immediately. I believe that this truly is in the best interest of BC Ferries. I can’t imagine that I am the only BC Ferries passenger who has ever raised these issues. Having discussed this with a few close friends – including some new residents in British Columbia – I was told “I’ve yet to be on any of the ferries and definitely would not ever consider taking [my dog] on one in the Summer – forget about Winter – after seeing what you have had to put up with.” Should an adequate response from BC Ferries not be received, I am very well prepared to extensively highlight these issues through strong local social media connections, as it has already proven to be a buzzed-about topic on blogs and Twitter. Should the issues require further media awareness, I would not hesitate to do so. I truly appreciate the attention paid to my letter and my concerns and trust that BC Ferries Corporation will do what is best and in a way that will clearly display the integrity and ethical operating standards expected by the general public from BC Ferries. Needless to say, the conditions were so disgusting that I would not let Jordy set-foot on the floor of the pet area. I could not identify a source for the bucket of water, so he wasn’t allowed to drink from that either. Please provide your thoughts and comments. While everyone will have a different opinion, please be respectful of your fellow readers. Any inappropriate or rude comments will be immediately deleted and IP addresses recorded and flagged. How has the petition been doing, Keira? If it is still active, I would like to forward it to more of my dog owner friends. Those pictures are horrible! I have heard stories about the entirely unacceptable conditions for pets (and their owners) on BC Ferries but have never looked at the area myself. That poor black dog looks so humiliated and uncomfortable. It was a VERY well written letter…my only comment would be that as a large dog owner I don’t think policies that discriminate on the basis of size are much better than policies that discriminate entirely against dogs/pets. Whether my “furkid” is 20 lbs or 80 lbs, we still have the same needs and deserve the same standards. I think that all dog owners should stick together rather than supporting separate policies for small and large dogs. There should be a proper room or space for pets and their owners on board…I wouldn’t even object if they charged a walk-on pet fee to maintain more suitable premises. @Stephanie – I agree completely. As I said, a dog is a dog is a dog – no matter the size or breed. Ideally, I’d like to see a fantastic space for pets and their owners that meets all dogs’ needs. The current standards are unacceptable. For those of us that choose not to drive a car (and therefore cannot keep a dog in a car while we use the washroom, etc. ), we are left with no choices. My caveat about small dogs allowed in passenger areas is only a single illustration of a change in policy that can be met immediately. If my small dog is in a bag smaller than some ladies’ purses and isn’t causing a disruption, I don’t see why it isn’t okay. It’s only a small step in a bigger problem that needs a drastic solution – a solution and change in policy that is inclusive of all dogs. Being that BC Ferries has a monopoly on the entire water transport system in British Columbia, change will only come about when the consumers raise their voices. I am very disappointed that not a single one of your recipients addressed your email. What a let down. Almost makes me want to swim over to the Island in protest now. This is very disturbing indeed. Never having been a foot passenger on the ferries, my dog has always remained in the car during the journey. I had no idea that keeping her in the vehicle was a luxury. It is an absolute disgrace that pets would be forced to such conditions, let alone their owners who are indeed the paying customers of BC Ferries. Your letter is very well written and it is shocking that you have not received a single response. Shame on the BC Ferries Corporation for not even simply acknowledging your concerns. I hope that the media does investigate this and bring awareness to the appalling way that BC Ferries is operating in this regard. Perhaps that is what it will take for them to realize this is not acceptable and compel them to rectify their policies. My experience. Winter 1.5 yrs ago my husband & I travelled the Duke pt. ferry (walk on) with our Yorkie. It was an old ferry(not sure if it’s still running). The “pet area” was an unprotected space under a bulkhead between the vehicles with 1 bench. It was freezing, no water and a rusty wet floor. I was hungry so I was able to go upstairs, buy food and bring it back down. I certainly wouldn’t leave my dog alone if I was travelling solo. Needless to say, it was a disgusting area to eat with no where to even put a coffee down. We were so cold we ended up “smuggling” our dog in our backpack upstairs (civilization). We complained about the sad state of a pet area but it fell on deaf ears. The “pet areas” on newer ferries look newer, self-enclosed with a mesh-like mat on the floor but the pets urinate on the floor and it pools so you don’t want to put your pet on the floor there either(plus it stinks). They need to travel down there to see what it’s really like. I really hope BCFC listens! I was appauled when I read your post. I have just moved to Vancouver and it had seemed to me that everyone here was so open to dogs. I’ve seen them in stores, off leash in parks and on the street. It seems that they are all very well trained and socialized here, which is more than I can for the province I just came from. So to hear the conditions and treatment of customers and their dogs on BC Ferries was quite surprising to me. I wonder if there are any minimum standards required for long distance public transportation that could support your email. For example washrooms seem like a requirement at the minimum. I am so surprised that you hadn’t even received acknowledgement of your email let alone a response. The photos are appalling…I am thoroughly disgusted. Keira… This letter was very well written. I am surprised that you were not contacted by bc ferries! Shame on them! Perhaps they are very busy with other letters of concern? I doubt they pay the PR staff what they should be paid…. I am with you, but I think Keira had a point in that we are being asked from the political and govermental communities to walk or bike or whatever, but to chose not drive a car, and then that choice to be cleaner air free people bites us back with this kind of thing. Nick forwarded this along to me, and I am praying that the right person gets a hold of it, so that changes can be made. If the saying is true pictures say a 1000 words and the pictures of the bc ferries say way more then a 1000 words to me. I beleive that in making this your mission you will have answers and action from the bc ferries. Keira I am sure that you will help make a difference traveling with dogs on bc ferries. 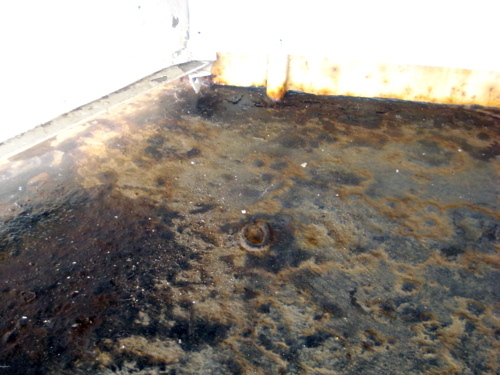 bc ferries sould be ashamed to have the world see there 3rd world conditions of the bc ferries. Thank-you for forwarding this letter on behalf of all of us pet owners. When I bring my cats over they stay in the car and I stay there with them. If I have a dog with me I do the same thing. I think this is ludicrous! I have a number of friends that have to walk on (myself included) due to the obscene cost of traveling by car. In this case you have no choice about where to keep your animal apart from the hovel offered by BC Ferries. Keep lobbying Keira and let me know how I can support you! Shame on BC Ferries. Great letter, and I’m also shocked that you didn’t get a reply, let alone confirmation of receipt. I too have had to travel on BC Ferries with my dogs and be confined to the “pet area” many times, both in summer and in winter. Like you said, it is a disgrace that BC Ferries knowingly lets passengers, who have paid full fare like everyone else on the main passenger decks enjoying all the services, amenities, and luxuries (like padded chairs), while we and our pets have to sit (or stand) in those conditions. During the summer I try and avoid the pet area all together, and just walk around the car deck with my dogs. But during the winter, that usually isn’t feasible. I hope this makes it to the media, because it’s definitely time for a change. You can add my name to the list of disgruntled pet owners who have to travel on BC Ferries! Wow, this is horrible. This needs to be changed immediately. I too, would never allow my dog in that area. Her health and safety is too important to me. C’mon BC Ferries – it seems like a quick, adequate response to this would save you money and reputation. There are 1000’s of pet owners planning their summer vacations right now – I’m one of them myself. Keira – pls let me know if you require any signatures or any other support. Thanks for taking this on! Sorry to hear about the lack of response, Keira – it must be horribly frustrating! It blows my mind that BC ferries can’t spare a few dollars to spiff up the pet area. Why bother advertising a pet friendly space if it is not friendly at all? Very disappointing. Way to go Keira! This really is an issue. I don’t have a dog-YET, but when I do and an taking him/her on the ferry I do not want to spend my entire trip in those conditions. I was told that originally the BC ferries were supposed to be a free service as an extension of the Canada highway-which of course never happened, but instead they have been routinely RAISING prices, which I think is rediculous. To charge what they do and then provide a space in those conditions is crazy! I hope the news does get word of this! Thanks for bringing attention to it Keira-you’re awesome! I’ve been complaining about this for years! The conditions for pets on owners on the ferries that make the gulf-island crossings are especially dangerous and degrading as you are forced to sit in very close proximity to boarding and unboarding cars. To hear that no improvements have been made on the new ferries is deplorable. I am disgusted with BC Ferries and hope that this issue receives the media attention it deserves. @Darren – I think it’s difficult to lend their sympathy for those that are not pet owners and/or have never been forced to travel on the vessels in these conditions – totally understandable! All I’m trying to achieve through this is to rally those that do own pets and want to see changes with our BC’s only means of water travel to lend their voices. BC Ferries has a monopoly in our Province and the only way a corporation is going to make changes is if their target consumers speak up. I’m not a dog owner (not yet anyway) but I would like to see a more positive approach by BCFerries in regards to passengers and their pets. I have seen people leave their animals in their vehicles with the windows cracked. An area outside I think would be good (though only on warm sunny days) for our four legged friends/family members. Like on the top deck. Not quiet sure how you could make it pee-friendly, but if they added some sort of ‘garden’ would be really cool to see. Imagine being on a BC Ferry with a grassy area!! A sand box? Though I’m sure that would be harder to clean/maintain lol. Thank You Thank You Thank You!! I have been complaining about this forever!! I moved to the lower mainland about 4 years ago and was a cat owner. Travelling back and forth to the Island is an important part of my life as it’s where my family still resides. I can’t count on my fingers, the amount of times I’ve had to travel walk on in the past with my cat in the winter months. At least on the new ferries they have a designated pet area. 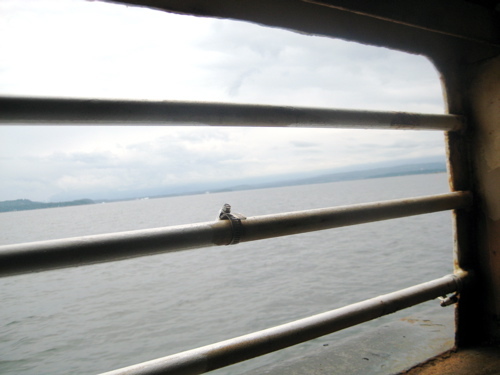 On the older ferries, there has only ever simply been two chairs facing each other by the garbage cans, stuck in between the dividers on the car deck. You are succombed to car fumes, and gusting and wet, icy ocean winds for the 2 hour ride. As you can imagine I am walways concerned for the health of my animals with them being exposed to such fumes. My family was shocked and outraged finding out I had endured such a ride! Luckily a kind BC ferry employee instructed me that if I were to go upstairs the back way, I would have a less likely chance of being caught with my cat upstairs (who is always in a carrier). They wrote to the ferry as well, but no response. Now the owner of Bulldog, as much as my family adore him, I hesitate to bring him over with what we have to endure. Travelling in the summer isn’t as bad now the weather is warmer, but the travelling season is busier too. Last time I took him there were 8 people crammed in this little room and 6 dogs. Trying to prevent 6 dogs from going crazy over each other, and leaving standing room only, was a nightmare. Luckily my dog is well behaved. And should they go to the washroom there is only a hose to rinse it down, a drain that doesn’t drain, and only a small area that has a raised mat, so the dogs get wet, and your bags if you’re not careful. It’s about time BC Ferries stops hiding from the numerous unsatisfied pet travellers it has. We cannot be ignored simply because we Require your service to travel..!! I don’t own a dog, and my dog-owning friends all travel with cars, so I never paid attention to the pet area of the ferry before. But since you last posted about it, I’ve gone to check it out on the various ferry rides I’ve been on and you are absolutely right, it’s an awful space – it’s just a cold metal box. One of the ferries I was on from Horeshoe Bay to Nanaimo didn’t even have a space to sit in there because the metal benches were broken. I don’t really have anything in the way of solutions, but I agree that it’s really unacceptable to have to pay the same as everyone else to be stuck in a poorly maintained metal box without very basic services. I am a regular passenger of the pet area. We have a 1-year-old child, and one set of grandparents lives on the island, so we visit almost monthly, and walk on to save money. When traveling, one of us takes our daughter upstairs and chases after the rambunctious toddler, excited to be on the ferry, who runs around for the entire 2 hours. The other parent sits with our 15 lb. dog in the designated pet area, trying to read a book while calming the dog, who gets jumpy with loud metallic ferry noises. I wish our family didn’t have to be divided on every single ferry ride. I’d leave my dog at the kennel to avoid the hassle, except ‘visits to Grandma’s’ are pretty much my dog’s reason for living. It’s not too bad, as long as a latte is bought before boarding, and the other dogs are well-behaved. All it takes is one mean dog in the pet area, and several of us passengers are looking for somewhere else to sit on the vehicle deck. I once sat on a coil of rope for an entire voyage! I find it interesting, Keira, that you’re rallying this passionately about the unsuitable conditions of the pet area when you have yet to experience a winter voyage. Be prepared! Traveling on a ferry other than the Coastal Renaissance in the winter is completely unacceptable for ANYONE. 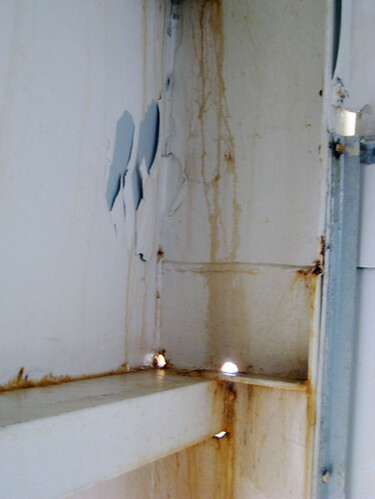 In addition to the conditions you described in your post, the metallic floor is ice cold and usually wet, and freezing winds are continuously blowing through the little unsheltered pen. I once forgot to bring my dog a blanket, and so she lay shivering on my lap while pressed against me for the trip, which felt like it was 5 hours long. She shivered for the rest of the evening even after we arrived in the Comox Valley. I myself was very cold even in a parka, scarf, toque, and fleece mittens.. (albeit I felt rather Canadian at that point.) Had I dressed as a regular walk-on passenger and not someone who happened to have snow gear in her bag, I strongly believe that my health would have been compromised. I would not be surprised at all if I heard of walk-on pet owner passengers, or their dogs, getting frostbite or hypothermia from this full-fare trip. So what I’m trying to say is, even if your case is not heard at this present time, I guarantee that you will have many more inhumane conditions to claim in the winter. Good luck with your fight for change. My dog and I support you! I feel your pain! Particulalry in terms of BC Ferries not responding to your letter. I wrote to them concerning the ridiculous parking situation in Schwartz Bay and they never responded. That is terrible customer service and I encourage you to take it to the media and not let them get away with it! WOW. I never even knew a pet area even existed on BC Ferries, let alone in the condition you experienced. As a pet owner, I’m with you. There needs to be an area that is better suited for dogs and their owners. If they can create “play areas” for children, I’m sure they can accommodate dog owners. I have to say I haven’t traveled with Junior on BC Ferries and have always been worried about it. After reading this I don’t think I can even consider traveling BC Ferries in the future. Wow, that’s just disgusting. I’m shocked. What are your thoughts if they improved the pet areas but charged you a fee for bringing your pet aboard? @Jenny – Haha, well, this is a tricky one to answer. Would I pay more for the pet areas to be improved? No, only in that they are far below any level deemed adequate in terms of safety and sanitation. As I mentioned in the letter, the areas are filthy, teeming with bacteria, rust and mold, there is no running water and no way to hear safety announcements. Whether someone is an “animal person” or not, everyone must agree that conditions such as these are not ever acceptable for any living creature – human or animal. Aside from that, I don’t think anyone should be penalized for bringing a pet on board. I don’t see the logic in a policy such as that. On the other hand, if BC Ferries created a strictly quarantined pet-friendly lounge area with basic amenities (such as food, water and warmth) on the ship, would I pay extra? Absolutely! I’d pay double! You know I’m with you one hundred percent on this one, Hon. Not only are the conditions appalling, but so too is the lack of even an acknowledgment. In normal circumstances, the consumer can voice their concerns about a company by not buying their product – unfortunately, this situation is an impossible ideal given BC Ferries’ monopoly on transport between the Island and mainland. Having yet to take the ferry on my own or with my dog, I cannot share my own personal experience – that said, so long as these are the conditions that dog owners (who are not also car owners) have to face, I will not be making the journey with George. To me the easiest solution for all parties would simply be to improve the amenities for dog owners. This way persons concerned about allergies will not have to worry and dog owners can ride in the basic level of comfort which should be afforded to all paying customers of BC Ferries. Let’s be honest – it wouldn’t take much to impress most dog owners. A cushioned chair, a little bit of heat and a water fountain aren’t much to ask for. I have always kept my pet in the car. I didn’t even know they had a area for pets. Now that I see the pictues, I wouldn’t even have a rat stay there, it is so bad. The B.C. Ferries, needs to step up to the plate, and clean this area up, and make improvements. I am ashamed to have visitors come to canada to see the games in 2010, if this is the kind of example we have for our pets…. I agree – this is ridiculous. My only concern is what happens to those of us with bigger dogs if the ferries decide to adopt the translink policy? As you said – dogs are dogs are dogs, regardles of their “job”, or as far as I’m concerned, their size. 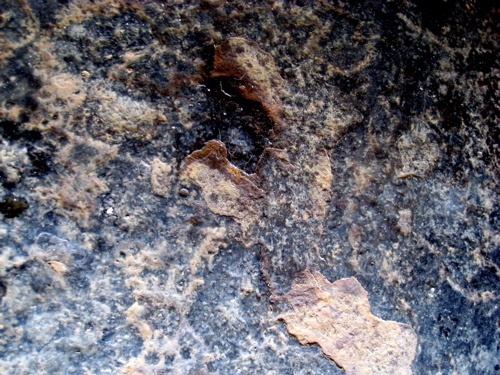 @Colleen – The well-being of all dogs is without a doubt important. I believe there are some changes that could be adopted by BC Ferries in the immediate, but naturally a long-term solution has to be found and implemented that is inclusive of all dogs. As an owner of a medium sized dog it is close to impossible to take him with us on trips to the island, which is unfortunate because out family lives there. However there is no way that I would force or allow my dog to sit in one of those pet-areas on the ferry. Being a 60lb lab mix, there is no way to just hold or carry him either. I don’t see why well behaved dogs are not allowed on one of the outside areas on the main or top deck. I hope the BC Ferries listens to you and I look forward to seeing their response. Have you considered calling the Olsen on your side on the tv station, he seems to get to the bottom of things – might be a good way to get people to listen and BC Ferries to respond. I am 100% with you Keira, and I understand your concern and frustration. In my experience, while addressing this kind of issues the larger the company, the bigger the support of the rest of the customers you need. I know it is not easy and reading your letter carefully, if they didn’t care about your disposition of getting more “media awareness” they won’t care about me or the other 39 people commenting on this. What we need now, is the support of the CKC (Canadian Kennel Club) and such. As a matter of fact, I recently read in their website that their Transportation Committee has been investigating the current circumstances regarding dogs flying into the USA. It took them nearly three years but finally reached an agreement with AirCanada to allow pets in cabin. It is a small victory, after the ban in 2006 but still a victory. I am hopeful that with the support of institutions and clubs such as the CKC and the proper media coverage, BC Ferris won’t have an option but to address this issue. All the best Keira, and thank you (in the name of progress… hehe). I am sitting on a BC ferry right now for the first time since getting my dog. I’m, like, shocked by the conditions of the so-called pet area. over a year later and conditions have not improve done bit – I took that same decrepit ferry over to Nanaimo for Thanksgiving and had to sit in that rusted out, dirty and COLD area with my 2 dogs. A passenger travelling with their dog by car actually brought their dog in to PEE ON THE FLOOR!!! we spent the rest of the trip avoiding the sloshing pee!!! agreed, the return trip on the new ferry was an improvement, but there were at least 11 dogs all sitting with an owner or 2 in the interior pet cabin – I sat on the floor as there were no seats available. I know this was published a long time ago, have you been on the new Coastal ship, and is the pet area any better? I recently went across to Vancouver from Nanaimo on a cold winter afternoon. I realized once we were moving that I had forgotten my wallet in the truck and went down to the vehicle deck to get it and saw two older women (65 – 70 years old) sitting in the dog area. They were bundled up to the hilt and their poor dogs were sitting there on their laps shivering! I stopped to talk to them and asked if they would like to go up and warm up and have me stay with their dogs for a bit. They both declined politely which I figured they would. So anyhow I went back upstairs and the first employee I saw I asked if there was any way that the ladies could come into the stairwell even. But he said no, they had to stay in the pet area. I sat with my husband for a bit but couldn’t get the picture of these two ladies out of my mind. My husband and I went down to the pet area and told them they could leave the dogs in our truck and come up stairs. They were apprehensive about the whole thing, not knowing us at all. So I offered to write out all our info for them and finally they put their dogs in the truck and we all went up stairs together. We learned that they live together in Vancouver and they had been to a funeral in Naniamo for a friend and these dogs were the friends and that they had no where to go but with these ladies. They didn’t bring their car because they didn’t know they were going to bring the dogs back with them. Also they weren’t dressed warm enough to be down there in the cold and wind and I don’t know how they would have fared the whole ride. It just disgusts me that BC ferries would be so ignorant! 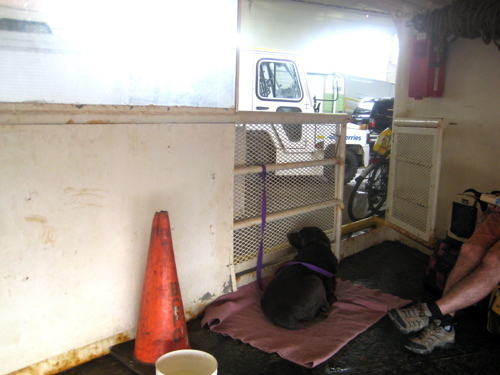 How dare BC ferries make people sit in such horrible conditions just because they have a pet and do not have the use of a car! I was and am appalled that these two senior citizens had to sit in the cold, frosty air because some idiot who runs the ferries has no idea about compassion! We should all write the newspapers about this and keep it up until something gets changed! Thanks for posting this. I frequently travel to and from the Comox Valley with my pet, so naturally we drive on. I have never traveled as a foot passenger on BC Ferries with my pet, but I have visited the pet areas on most of the major vessels (with the exception of Tsawwassen-Swartz Bay/Route 1) and have experienced this first-hand. 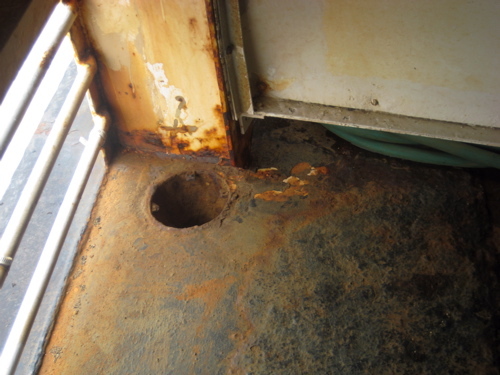 Some of the minor vessels operating on short-haul crossings have washrooms on the vehicle deck, so I do not understand why that is not instated on any of the major vessels. I feel that these enclosed areas should be equipped with a heater, adequate seating and absolutely fresh water for the pet. If I were to travel with my pet, I would be quite disinterested in packing a water dish and blanket among the various things I already travel on BC Ferries with. From my knowledge of how a ferry operates and a lifetime of commuting on almost all routes, I know that it would not cost a great deal to implement. The reason BC Ferries cannot permit pets up onto the passenger decks like TransLink or BC Transit is because it would become a health violation on part of Health Canada’s strict regulations, mostly because the ship’s passenger lounge is considered an operating restaurant (Cafeteria, Snack Bar, Buffet, Coffee Lounge, etc). 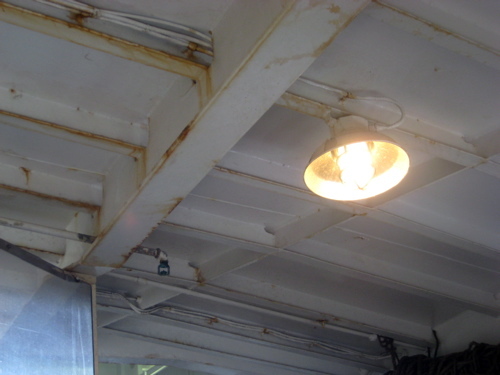 Food is allowed on all areas of the vessel, so some area segregation would have to take place before even small pets in carriers would be allowed to enter the area. I encourage you to continue your pursuit of adequate conditions for passengers traveling with pets. I would not be able to imagine two hours in nautical confinement. A link to this blog was posted on a friend’s Facebook page today (01/24/2012) so I apologize if this response chain is really old. Just thought I’d post as someone that thinks otherwise. Yes BC Ferries, should at the very least, provide a response. Even if that response is “We have no plans to improve the pet facilities at this time”. They are now a business and no longer a crown corporation, so they don’t really need to provide any response at all. If the arguments are, “we are tax payers and are being discriminated against”, I disagree. Despite the fact that BC Ferries is a business and not a crown corporation, YOU are a tax payer, your dog is not. If someone has to use the an airline (a business) do they pay for the service? Yes. Does this mean they can carry their 60lb lab in the cabin with them? Nope. They CAN, however, put ‘Pookie’ the Yorkie in a pet carrying case and stuff it in the tiny space under the seat; ‘Bruce’ the Labrador may stay downstairs. I will, however, certainly agree on the point that folks should be able to carry their small animals in small carriers within BC Ferries’ main cabin, much like those carried by passengers on flights. Though what happened to the fine method, leave your dog in the car? Any well trained animal should have no problem staying in the nice, warm, comfortable car. Or, gasp!, leaving your dog at home?! Unfortunately not everyone’s pet, big or small, “is super friendly”, “loves to cuddle”, “is harmless”, “is super well behaved”. Unfortunately, poorly trained animals and irresponsible owners spoil it for the rest.That’s sucky but true. Hi Marshall – For the most part, I do agree with your points. Having now traveled on the ferries with my dog for close to three years, I don’t see bringing pets onto passenger decks as a feasible option. For many passengers toting pets, leaving said pet at home is also not an option, nor is leaving said pet in the car (I am a pedestrian and do not own a vehicle). BC Ferries is, in fact, only a semi-privatized corporation. As long as they are looking to the provincial government for partial funding, then I am of the opinion that they should at least be somewhat accountable to the public. While I am not necessarily seeking equality with those passengers that are not traveling with pets, I am adamant that sometimes traveling with pets isn’t always an option and, as paying customers, we should at the very least be entitled to the same basic amenities as other passengers (being shelter from cold, running water that’s potable and bathroom facilities). These provisions *can* be made on the car decks if BC Ferries was willing to. At the end of the day, I just want all passengers to have to steer clear of an uncomfortable voyage, not unlike the two elderly women described in the story two comments above yours. However, until one has actually traveled on a ferry with a pet, it’s not easy to provide a balanced opinion on the matter. For many of us, it’s the only choice we are offered. 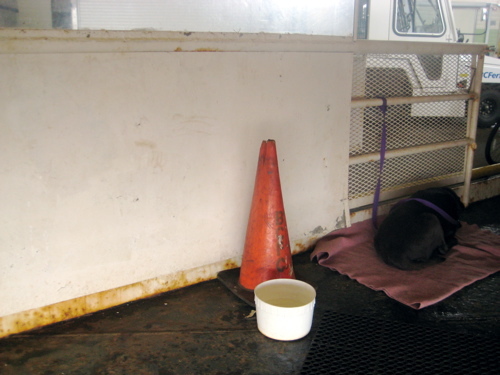 The conditions for pets and their owners on BC ferries is so shameful, its makes me sick. 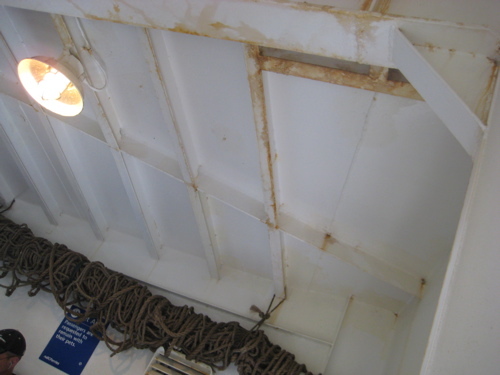 As I write this we are in a pet area on the car deck of an older vessel, uncovered, loud, uncomfortable and the only thing that it looks like they gave a damn about is the sign on the wall marking the area.